Neck pain can be the most difficult pain to overcome. When your neck is in pain, no matter the extent or cause, you can suffer from mobility issues and increased tension in other areas of your body, making everyday activities seem impossible. If you’ve ever woken up with a stiff neck, felt stabbing or shooting pains following an accident, or experienced numbness or tingling in your neck, chances are good that you’ve sought professional help to provide you with neck pain relief. 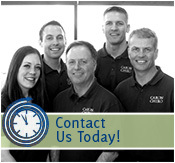 At our St. Paul chiropractic clinic, we treat neck pain using chiropractic spinal adjustments and massage therapy techniques, ensuring that you receive the treatment you need for lasting neck pain relief. Each patient suffers from a different type of neck pain and different sources of neck pain, making neck pain treatment somewhat personalized. However, neck pain can often be treated with spinal adjustments, which target neck pain caused by misaligned vertebrae in the neck or back. Spinal adjustments can be used to relieve muscle and nerve tension, which can also be causes of neck pain, especially when your body has experienced trauma that has negatively affected your neck. Whether your muscles are stiff, you have a pinched nerve in your neck, or your vertebrae are misaligned, a spinal adjustment could be exactly what you need to relieve your neck pain. Massage therapy has become a recognized means of treating injuries and conditions and providing patients with a natural pain relief alternative to medications. Although you may be used to thinking of massages as a luxury experience intended for those who simply want a day to relax, massage therapy can offer so much more than relaxation. Massage therapy is now recommended for patients in need of chiropractic care, and that’s why we’ve made it a part of our chiropractic services – so that you can get a holistic neck pain treatment plan that integrates the most effective elements of chiropractic care for neck pain relief. We offer a variety of massage techniques, including soft and deep tissue massages, Swedish massages, and trigger point massages, which are intended to treat different types of pain depending on the cause and location of your pain. Neck pain is something that affects people every day, and sometimes it may feel like there’s just no way of avoiding neck pain. However, neck pain is as preventable and treatable as any other injury or pain, so if you’re someone who has been ignoring the signs and leaving your neck pain untreated, stop waiting, and get treated. Neck pain can be caused by any number of accidents, injuries, or even everyday strains on your neck. That means that, even if you can’t remember hurting your neck, your neck pain is very real and likely very treatable. You could be suffering from neck pain due to the way you sleep, poor posture, looking over your should when you drive, or even just holding your phone up to your ear one too many times. Neck pain can also be caused by injuries, which typically involve your neck twisting or pulling with enough force to leave your neck strained, sore, or in pain. A neck injury can be sustained if you slip or fall, moving your neck too quickly, in an auto accident, or while exercising improperly. Neck pain may be caused by a slight problem that can be easily treated, or your neck pain may be the cause of an extensive injury that requires chiropractic care for an extended period of time. One of the causes of neck pain that we often see, and which is often ignored by patients until it becomes severely painful, is whiplash. You can sustain a whiplash injury in a number of ways, most commonly during an auto accident. Whenever your head is forced away from your body, placing extensive strain on your neck, it’s likely that you’ll suffer from a whiplash injury, which can cause immediate pain or may not be apparent for weeks, or even months, after your accident. Whether you’ve fallen, been in an auto accident, or strained your neck some other way, if you’ve sustained whiplash, chiropractic adjustments and massage therapy can help relieve neck pain and tension, heal your neck injury, and prevent future neck injuries and pain. Contact our St. Paul chiropractic clinic today at 651-255-9999, and learn more about our neck pain relief treatment options. I was in a severe motor cycle accident in which I was ejected into the front windshield of a car. The doctors found a fracture in my neck and worked together with the medical team to restore my health. Any pain that pops up, I’m at their clinic that day to get relief. They have an awesome team. I highly recommend these doctors for anyone in an accident.